A magnetometer is a scientific instrument used to measure the strength and/or direction of the magnetic field in the vicinity of the instrument. Magnetism varies from place to place and differences in Earth's magnetic field (the magnetosphere) can be caused by the differing nature of rocks and the interaction between charged particles from the Sun and the magnetosphere of a planet. Magnetometers are a frequent component instrument on spacecraft that explore planets. Once submitted, we will try and place you in contact with a suitable Magnetometers supplier within 48 hours. 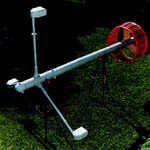 Model 10 VSM Vector Magnetometer from MicroSense, LLC. Earth Magnetometer from AlphaLab, Inc.